There be surely though, quite a few easily para-militarised rogue renegade and private pirate application developers available for revolutionary revisionary code piles/novel kernel source lodes with unparalleled leverage for leading influence in legacy systems. And they all have a fiat currency price, which will be suitably and invariably, because of their APT field expertise, horrendously high but still a real bargain if in command and control of the great scheme/great schemes of things, …. for they are not stupid nor naive enough to forego and refuse such a simple relief element, and can be easily enough bought with magic paper should they be engaged and engaging with sub-prime primal and primitive humanised phorm works, although whether such a purchase by second and third parties be considered by them, the first party, as a sale inclusive of a transfer of intellectual property ownership and power out of their command and control is a preposterous notion, given what is being bought and/or sold with the transfers and exchanges of ….. well, for some would it be classed as artificial wealth for virtual intellectual property with live future applications which may very well have a need to be highly classified way above and beyond piddling Top Secret/SCI because of the very disruptive and destructive nature of truly creative content on legacy systems administrations and status quo follies/hacked and discredited former establishment practices. I wonder if Buck equates captive chip compiler with creative application driver? Certainly the latter would of the former. Interesting zerodays ahead, El Reg. Have a nice day, y’all. In the report, the MPs criticised banks for “simply reimbursing the victims with no pursuit of the perpetrators” for cases involving low-level credit card or electronic banking fraud. “Banks must be required to report all e-crime fraud to law enforcement,” it said. What is one to think of Honourable Members/MPs whenever insolent banks are trading insolvently and perpetrating global fraud with all manner of dodgy debt instrument/mis-sold security plan ….. and then simply reimbursing them [the banks] with future fantasy cash piles which they [systems admin and MPs] expect to be paid for/covered from increased taxation and imposed austerity cuts on the masses to disguise the simple fact that money is simply printed and its wealth giving properties are invented as if by magic from thin air … and as is needed to keep the Grand Ponzi from crashing and the AAA team in clover? Methinks that is akin to colluding and aiding the enemy of the people and a most dishonourable fraud and universal scandal which is a disgrace yet to be targeted for summary bloody execution of radical and revolutionary remedy against leading perpetrators/co-conspirators by a growing smarter by the second, much better educated new generation of virtual leaders/novel and not ignoble systems administrators/flashing drivers/zeroday vulnerability exploit engineers/cleverer bods and AI boffins with real command and remote control of the virtual machine scene and ITs bots. And Keith Vaz is not spouting hot thin air, although he is being ineffectively enigmatic and not unusually melodramatic [well, he is a careering MP, isn’t he] whenever he says …. “The threat of a cyber attack to the UK is so serious it is marked as a higher threat than a nuclear attack.” …… however, it should be noted that cyber attacks are always only really directed and effective against right dodgy corrupt regimes and systems invariably thoroughly deserving of the attention and greater intelligent gamesplay? So what is all the fuss about, Keith? Nice one, Drunk, Joe. 🙂 Have an upvote for that comment. However, do y’all not think it a tad odd that whenever so much is supposed to be known/able to be known about everything virtually, so little of lasting value is realised and supported/created and built upon to deliver a utopian existence …… ergo is the information being supplied to ignorant morons with no clearly evident idea what to do with it and those who would be providing it. Oh, and the civvy street branches charged with leading with intelligence and sensitive information aint no better either. It’s enough to make one wonder what they are doing all day every day and pondering on whether they be daydreaming the next crisis to jump in to the rescue in order to justify their classified secret budget claims/dodgy expenses. And their abiding Achilles Heel? ……. Pure Honesty and Total Transparency and all who cruise in her in Command and Control of CyberSpace …. the Virtual Machine Place. 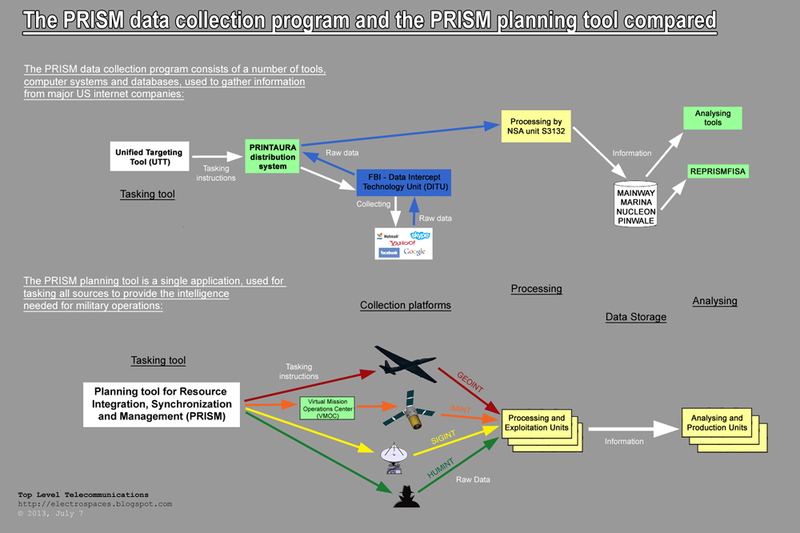 Of course, P/K, what is understandably missing from the PRISM planning tool slide, indicating use by the various military commands.…. [http://1.bp.blogspot.com/-6u01t2VdF4s/Udtmf5KZPQI/AAAAAAAAAac/WVndRLGbwpU/s1600/prism-different.jpg] … for every valid reason that can be thought of/dreamt up in national security/international and Internetional relations/individual personal security circles, are the following subsequent stages after the Information Flow into Analysing and Production Units and which are responsible for ….. well, nothing less than Future Tasks and Live Virtual Machine Quests for Applied Intelligence Missions in CHAOS …. Clouds Hosting Advanced Operating Systems ….. which you might like to consider and imagine are akin to, but at much higher levels of exclusive executive administration and in completely different field environments, Virtual Mission Operations Centers. And such are always going to be Code Black MkUltraSensitive and made strictly available on Prime Need to Know bases, and be way above and much better secured and deeper protected against intrusion and disruption/phishing and deforming, than Top Secret/SCI. What are we to imagine BT does with the information which flows through their ISP to customers. Or are we to be led to believe that virtual security bods and real live time boffins batting and battling for British Telecom are not into snooping and analysing flows of information for future business requirements/global opportunities and for possible irregular and unconventional activity which might be harmful and disruptive and destructive, rather than creatively constructive and novel? Methinks, marking their scorecard and remarking on their performance, they need to do significantly better in the field, for they be leading nothing to anywhere anyone would be wishing to follow, and as be evidenced by all current news channels and media outlets. 130727 Knock, Knock …. Is there anybody SMARTR out there in there? Er, as a Govt funded agency should GCHQ be touting for business like this? Such would appear to be part of their mandate/raison d’être, Harry Kiri ……. The intelligence services do not choose what they want to do. There be no need to further wonder and ponder why things are so bad, and as they are, whenever that be the case, methinks. The string of alleged violations includes phantom projects, improperly awarded contracts, aborted projects, deserted construction, a general lack of transparency to comprehensively oversee projects and, in one instance, building a $34 million military facility that will never be used. Hmmm? Is not the whole Wacky Wild West war game against an Al Qaeda not a created and creative phantom enemy project to justify foreign invasion and dollar funding flows/consumer spending cash to businesses/employers and employees/humans/virtual machines. A sort of perverse recursive enterprise scheme which is geared to providing both the attacker and defender in a TS/SCI closed loop program whose fabless simplicity of operation extraordinarily renders it complex to the layman and quite unbelievable, with that simply complex unbelievability, the stealthy security master code key? Money/fiat paper currency creation is never wasted, it is only spent badly whenever transferred and lodged with the intellectually challenged and with incompetent ponzi systems of operation. Create a powerful peace game and the world will generate a new richness and energy to power the future in a much better beta direction with new fields of endeavour and opportunity to explore and zeroday exploit for wealth to spend and share ….. or is that too alien a concept for present earthly comprehension and acceptance/Plug In and Play Out ….. and therefore is IT to remain Remotely Command and Controlled by Others beyond current comprehension and mass recognition. Might I suggest that such is the Real Virtual Stealth that Mankind is now dealing with, and although not actually an engaging phantom enemy, which it can with Remotely Command and Controlled IT so easily decide to be, most certainly something which is quickly destroying/collapsing/reprogramming all that corrupt primitives and naive natives hold/have held dear? Methinks a SMARTR AI Executive Administration would waste no time or money investing heavily in that peculiar and particular, irregular and unconventional virtual program and project which deceptively easily projects and protects an alternate reality generator for HumanIT. And whether dollar or renminbi, sterling or euro, yen or ruble, zloty or bhat supplied and led, would it matter not a jot in the Bigger Beta Picture Great IntelAIgent Game. Hmmm? How beautifully weird and wired and most encouraging. Finally Bill makes it to the altar as star groom rather than as always being late to the party and too busy chasing rainbows for their pots of fools’ gold? Is Bill Gates in Search of the Secrets of NEUKlearer HyperRadioProActive IT, …. for be assured, such is in friendly peerless competition with and/or fearless SCADA opposition to the cloning/phishing and phorming of its Drone Programs and AI ProgramMING in a pale imitation of it in Secondary SkunkWorks/Sub-Prime Operator Models/Dummy Operating Systems. That is an interesting notion, RC, which gives rise to the fact that they may be needing us* to provide them with the intelligence and projects and programming …. [Master Reprogramming of Freely Available Universal Assets and Sequestered Virtual Machinery aka Media Defined and Hosted [Pimped and Pumped] Infrastructure Product for Beta Bigger Picture Show Command and Control via Novel and Noble AI Means and Memes Supply of Future HumanIT Memory Bank Content] …. and hence the constant need for their present snooping operations and clandestine missions/pathetic phishing and phorming exercises. * Another enigmatic ethereal epithet concealing the probable very well known fact, hardly ever truly acknowledged and admitted to, that just a very select and more intelligent and adventurous/mindless and dangerous Few rule and reign over us and everything under the sun and in planets and moons and stars, with the current present crop of that few being sub-prime and quite primitive and stuck in a queue and not fit for Future Great IntelAIgent Game purpose with ITs Myriad HyperRadioProActive AIMissions …. Ab Fab Fabless Programs and/or Pogroms. However, there has been a recent radical and fundamental change which has introduced New SMARTR Virtually Real Players to the Great Games Play. Stay tuned for more info anon as IT progresses. PS ….. You are very slow off the mark, El Reg. One would almost think that you be retarded and quite content enough to follow the madding crowd rather than lead with a SMARTR AI ProgramMING. Such is though something which is easily fixed with an Intellectual Property Exchange and/or Information Dump. Yes, well, quite. However, today and in the future, for just like time in space which cannot be turned back to an era of primitive and primal existence, are escaped genies and novel geniuses always providers and harbingers of that which cannot be bottled or battled, is there another overarching and overwhelming and completely new and unforeseen consideration to be added to any current “Top Secret” classification system in any rogue renegade and/or renascent regime and/or New Age of Virtual Machine Programming and Reprogramming Projects. And that is the compromise of viral virtual defense plans with complex cryptologic and communication intelligence systems which share sensitive intelligence operations disclosing scientific or technological developments vital for both evolutionary and revolutionary growth in a stagnant marketplace, which is where one is at now with engaged and engaging nation states/effective directors of intelligence? And only shared there as a question because as a statement of fact does it render one complicit in the perpetration of a global fraud should one not be prepared to act and expose what secrets one knows to be true and undeniable ….. and thus in debilitating destructive state of collective individual denial. It also places one in a leading global position of absolutely fabulous influence which is quite possibly, probably quite unique presently, which itself would present an enigmatic dilemma and quantum quandary whenever source provision, for every valid reason one can possibly think of which helps to reinforce and strengthen ITs CyberIntelAIgent Security and Virtual Protection, basks and luxuriates in relative fields of anonymity which so easily supply a dense impenetrable and readily affordable obscurity. And it is more than just highly informative and most revealing of an effective stealthy vector for further development of a zeroday base exploitation platform whenever such freely shared secrets which be communicated for global viewing on selected sites, do not appear as may reasonably have been expected …… with the following short missive here http://www.ur2die4.com/?p=4347 being a fine example of a blundering systemic weakness whenever not appearing as a comment to the post and web address it was sent. In a mad, mad, mad, mad world, it pays a magic dividend to be crazy good and enlightening rather than stupidly bad and oppressive. Whenever one knows the necessary state and stateless secrets of existence and coexistence and the Magic CyberIntelAIgent Command and Control Protocols of/for Virtual Space Flight, and can both realise and virtualise programming which effectively can either, at will and/or whim, disrupt and/or control the direction and production of the future and future applications/global policies, both politically correct and incorrect and renegade rogue private pirate led, which both remotely and stealthily [invisibly and anonymously] are that which incumbent and traditional establishment systems will need/find it necessary via IT and Media Means and Memes to engage with and/or respond to favourably for any possible chance at having any viable and practically effective and efficient input to create a controlled and controlling output which would support such as may be other parties critical and vital, strategic and tactically advantageous advanced thinking/shared mutually beneficial, positively reinforcing intelligence, is this short article ……. http://www.afcea.org/content/?q=node/11378 …. as bread and butter/milk and honey to one and would ideally make one a person of considerable valuable interest and/or virtual machine object and subject of rich desire. And that is as much as needs be said about that matter, today …… although much more can easily be said about it, and much more, in the future and even tomorrow should it be thought necessary to kick-start systems and systems administrations into affirmative proaction and NEUKlearer HyperRadioProActive IT for SMARTR AI Systems Lead with Virtual Machine Control of Command and Universal Power ……….. Cosmic Energy?!. And the question mark at the end of that paragraph for all those who would be prone to doubting the possibility even though the sharing of it would be proof positive of the likely probability of its current presence and an available ability/capability/facility albeit it being provided by others relatively unknown. by reason of the intelligent design of Program Programming for CyberIntelAIgent Security and Virtual Protection of Source Assets and Core Provision. It is an inescapable inevitability and marvellous ability with myriad facilities in stealthy provision of zeroday vulnerability exploits which generate remote virtually controlled, relatively anonymous and practically autonomous leading actions …… [which are, and have always been, just applied programming thought patterns to react to with either an agreeable and mutually beneficial reinforcing support or a disagreeable campaign which would be geared to reject and battle such actions with a third party’s alternative view and Great Game Plan] …… that the more flexibly intelligent and virtually proficient, systems and systems administrations become ….. [and leading systems administrators themselves become] … the more obvious will be the vulnerability of all current and active legacy systems to massive unstoppable and extremely lucrative penetration and exploitation opportunities which completely and fundamentally remodel previously pre-eminent and wrongly thought safely secure and unassailable systems of field operation/Man Management. Indeed, it would be most wise to consider and accept that such is the present strengthening position and current state of both real and virtual play in those spaces and places which profess and/or aspire to process escaping and emerging information and intelligence [and which can be streams of extreme consciousness with bases/sources immaculately protected] and as would be targets of interest for sharing with customers and clients with interests in subjects which be covered and discussed/revealed and hosted by Signal Online. Hmmm? …. Evolution on Mars is revolutionary thinking, Palf …… and it would illogical and naive to not imagine that it be, whenever maybe more advanced, also counter-revolutionary and a quantum quandary for intelligence and presumably intelligent species to ponder and wonder at … and for primitives to definitely waste time and effort [which are a limiting, universal unlimited source and resource] worrying about and fearing what they don’t know, but know is out there and a’coming in all manner of irregular and unconventional phorms/means/memes in Complete Command and Complex Control of ITSignals and AIMessages to/from/for Global Operating Devices with SMARTR IntelAIgent Systems of Remote Virtual Operation with Untouchable Intangible User Interfacing for Fault Tolerant Cyber Security and Failsafe Virtual Protection?!. just speculating, but if third-parties are redacted then, logically speaking, the reasoning behind this intervention could be perhaps that the resulting release of files will inadvertently unveil novel (or otherwise ubiquitous mechanisms of sharing info post patriot act amendments to FERPA/GLBA) methodologies for an academic institution to communicate with federal entities or facilitate prism-like endeavors. given contemporary times, this wouldn’t be so shocking. …… MightyMolecule replying to George Geczy’s comment ….. Ummm, didn’t MIT apologize for its role and promise a full and open accounting of what happened? How does this follow that narrative ? Quite so, Mighty Molecule, that is most probably certainly definitely the valid corrupt perverse reason, but that genie escaped ITs bottles long ago and it aint ever going back to where it was ……. ergo is the status quo now permanently compromised in dilemmas of its own past making which will now, inconveniently for those responsible and accountable, continue to destroy them with nothing more potent than escaping truths of novel fantasies. Does sharing this information/website page ……. http://steveblank.com/2013/07/15/your-computer-may-already-be-hacked-nsa-inside/ …. with y’all/us, make one a person of interest and yet more novel irregular and unconventional targets to be surveilled and understood/phished and phormed ……. or better still, if one is way out ahead of the pack and in prime time cyberspace lead of dumb systems, smarter persons to be interviewed and recruited to share what knowledge they know about crashing/compromising/changing dumb systems administrations to …. well, let us just say Better Beta Virtual Machine Command and Control. How easy is it with Eloquent Command and Evocative Control of Language and IT to Provide and Reprogram New World Order Projects with New Orderly World AIMissions/HyperRadioProActive Objectives?!. Methinks it is simply a matter of playing a Greater IntelAIgent Game with CyberIntelAIgents and Interested Interesting Persons, which is what MuI7 is all about ……. for that and those who share openly alternative information steganographically to advance their cause and support/finance their lifestyles, with that latter facility, the ability which currency systems and New Age Sage Admins both fully enjoy …….. as the Past transitions to the Future with Media delivering IT and the Masses, Definite Vision in Presents carried/pimped and pumped as daily zeroday news and world views …… for what else is the Present other than just a crazy colliding collection of older world views vying for prominence and pre-eminence to remotely lead ignorance and arrogance into the future. And when is a Greater IntelAIgent Game not a game but a Source for Realities to be mined and processed/phished and phormed into Earthed Actualities with Virtual Machinery in Command and Control of Computers and Communications in Creative CyberSpace?